I’m very thankful for all the answers of our questions you give to all of us! If I am correct you asked us a question last week, about how we look at the planet A/B compromise/plan. This is a very good question because it lets us think and co-create this part of the Ascension scenario. 1. Reassurance through your and our wisdom/knowledge and experiences. 2. The collective power (co-creation) of Ascension. Ascension scenario (co-creation of all of us (The Light = PAT = 1% Light))…. There are several inconsistencies in your scenario, which is otherwise very imaginative. After thorough consideration I decided to leave it to up you to make a new analysis on what you have written and streamline your scenario one more time by eliminating the inconsistencies. After that I will discuss it with you. It is a much better way then to tell now where your inconsistencies lie. It took me a while to process your comment. Your answers are very honest and sincere that it touched me. I didn’t understood it at first, but I let my emotions flow and bring my unconscious thoughts on the surface. It brought me much clarity and that’s the way for growing. For each error and tears something beautiful comes out of it and that I’m grateful for your comment. I’m glad that you didn’t told me where the bumps are, it give me an opportunity to work closer with my thoughts and higher self. It’s a working process and very new to me. I’m still figuring out the scenario and I will read also the New Gnosis – The Evolutionary Leap of Mankind – again because it contains important information about the higher self. I would love to work side by side with my higher self and this my current goal. I just want to share this with you, thanks for everything. Have a lovely weekend. The whole life is error and trial. I wrote three books on the Universal Law which later appeared to be crap and I burnt them, but this led me to writing the fourth one – volume I and this was the final optimal result. To rewrite an email is peanuts in comparison. To rewrite my email is indeed peanuts in comparisons with your book the Universal Law. I didn’t know that it took four versions, I think your book will be a legendary book on planet A/B, it will be a lot more appreciated then in this current world. I drastically change my old End Times scenario by learning and searching more about it. It’s a little summary for seeing the picture a lot clearer. 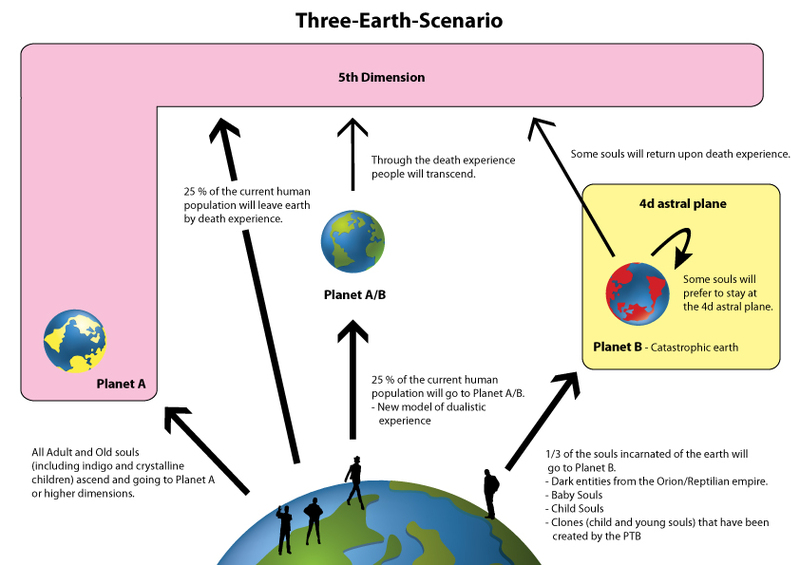 I also made a picture of the three-earth-scenario. All the members of the PAT ascended beyond the 5th dimension, but stayed on earth. My own experience: waking up with much loving energy. More loving energies for helping humanity to let go everything that is Orion-based. An important decision was made on a soul level. This decision was a third timeline planet A/B for the people that are not quite ready/ awaken for ascension but don’t fit on the catastrophic planet B. My own experience: with a lot of energy I got up the next morning (27 February). A couple days later I made a very important decision with my higher self to step further away of current society. Every cell in my body knows this decision and resists a lot more that is not in resonance with me. My own experience: the night from 8-9 march I felt a huge energy wave, there was a lot going on in my body and I thought tomorrow morning everything will be different. On 9 March everything looked the same, but I felt very happy that day. The completion of the Crystalline Grid will establish a new energetic field and the dark entities loose their grip of controlling and suppressing humanity. 2. First splitting of the timelines. Splitting from this earth to planet A/B and B. The energetic change of this earth into two planets trigger/occur hand in hand with the magnetic pole shift. The energies will change the environment of planet A/B, but it will not cause too many victims. – The dark entities from the Orion/Reptilian empire. – Clones (child and young souls) that have been created by the PTB. The rest of humanity will stay on planet A/B, it’s the same as this earth, but without the dark entities. There will be a new model of dualistic experience. The energy field of planet A/B will be optimal for the PAT members to change the old carbon based body into a crystalline light body. The PAT will educate humanity on planet A/B for awakening and prepare them for mass ascension. 4. Second splitting of the timelines. 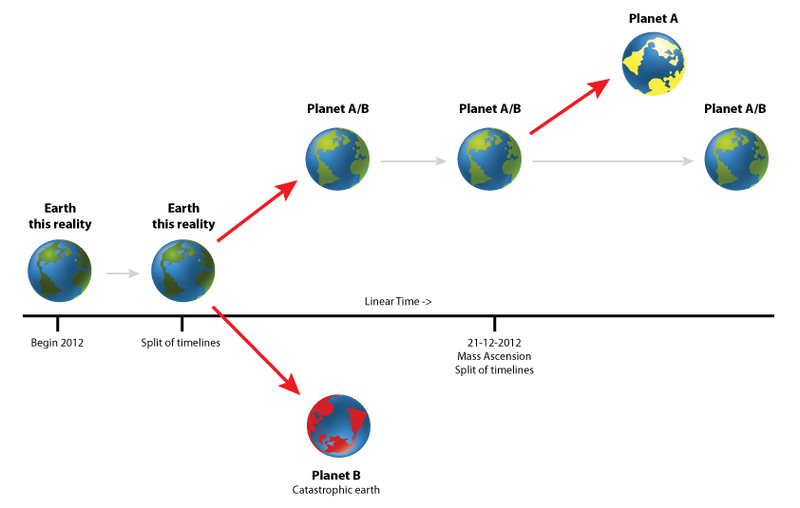 The splitting of planet A/B and A. The second splitting of the timelines is the same as Mass Ascension where a part of humanity will go to planet A. This part of humanity consists of all Adult and Old souls (including indigo and crystalline children) and will ascend and go to Planet A or higher dimensions. To understand how the end times will look like I made a picture below. 1. Is the splitting of earth into planet A/B and planet B multidimensional based where two scenarios from the omni-earth will be reality? 2. Will our current earth ascend in march 2013 on their own? Because everybody will go on planet A/B or planet B with the first split of timelines. 3. When mother earth will ascend next year to the 5th dimension will it be planet A or a different planet? 4. In the 3th dimension we have a veil of forgetfulness, the soul is the “controller” of the human on earth. When we ascend to the 5th dimension is there an other veil of forgetfulness? The funny thing is when I made this new scenario summary, I couldn’t always figure things out because of my 3th and 5th dimension thinking. To understand some things I must for example implement multidimensional and linear thinking at the same time. It’s a good practice to learn the difference and my own currently limitations. I think it’s important when we all are on one-line with our co-creation/ Ascension because the energy will flow much easier and effective. How does this scenario and pictures resonates with you? Thank you for your time. The new scenario now reflects the latest information given in the two publications based on the conversation of Valeri with CA. By the way Valeri is 21 years old and I think that he has done a great job in this respect. There are some details that have to be worked out regarding the precise percentages that I will address in a new publication which I intend to write tomorrow or the day after. Therefore, you could not know these details, but your version is very close and precise to what has been published or will be published soon. Your effort has not been in vain, now you have a clear view. I will answer your questions below in the body. I do not understand exactly what you ask, but let me give you my version: My personal conviction is that there will be a definite dimensional split between earth A/B and earth B this spring, so that after the split, there will be no longer any dark entities from the Orion Reptilian empire and their minions on earth A/B. To achieve this, earth A/B must be placed somewhere between the 3th and 4th dimension. It will still retain its physicality, but the social structure and technology will change dramatically for the better. I have no idea where do you have this date for mass ascension – March 2013, when all sources nowadays unanimously tell you that mass ascension will be on Dec 21, 2012, shortly after the last stargate 12.12.12 will be opened. There will be no veil of forgetfulness in the 5th dimension. This veil only exists in the 3rd dimension and even there not always, or not that much pronounced as on the present earth. However, at the beginning the ascended masses may not be able to live multi-dimensionally, but will stay for a while in the reality of the new 5d-earth and slowly learn how to explore other parallel realities and dimensions. In this sense their awareness will still be limited and there will be barriers (not veils) that will hinder them to enter new dimensions at the beginning. I think it’s important when we all are on one-line with our co-creation/ Ascension because the energy will flow much easier and effective. How does this scenario and pictures resonates with you? This is the actual purpose of such exercises – to start thinking multidimensionally – hence the need to rewrite your visions several times as to explore different alternatives. During such exercises one always gets help and further information from the HS. The End Times scenario is one big puzzle, there a many important pieces and they change by the time. When I read the information from Valeri, it change again my view of my scenario. He brought very important information to us and I’m very grateful for him especially to know he is a young fellow. But I’m also very grateful for you and all the PAT members for all your efforts and to come to this point where we are now. My version of the end times doesn’t bring something new on the table, but is only new to myself. I thought, I understood and believed everything about the end times because when I read your website it resonates highly with me. But when I write it down in my own words I was surprised to see that my version had many wholes, misinterpretations and old beliefs. I can understand everything, but I can only write a version of the scenario if it is truly a part of me. That’s the reason why my thoughts had to be cleansed, checked with my higher self and transformed, so that on all levels it resonates with my whole being and most important that it matches with you and the PAT members. So thank you for your response and for saying that it’s a clear view. When all the little bugs are deleted/transformed from my own view of this beautiful time where we live in, then the energy can flow much easier. My own view is now more balanced so it gets more creation power of our co-creation plan Ascension. Thank you for answering my questions, it clean out the misinformation that I had unconsciously. Your answers where the missing pieces because now I see the splitting and Mass Ascension a lot clearer. I have learnt a lot to rewrite my visions over and over again because it is changing my way of seeing the big picture in different ways (multidimensional). And indeed to see how my HS helped me along the way. I will keep track of your website for your precise percentages in your upcoming publication, just like every day. I am very happy to hear that you have recognized and personally experienced the necessity to re-write again and again one’s own version of reality as to improve it each time. All processes in Al-That-Is are of circular nature as evolution occurs in a spiral way. Evolution is not a straight line pointing at infinity. This linear view must be abolished for ever. You have now realized that there is no such thing as fixed scenario, but that the course of events is changing constantly as a function of what humans think, feel and do on the ground, and why all forecasts must be constantly re-evaluated and adjusted to the altering circumstances. This is what I am doing for the last 20 years. You are now on the right track. By the way, before Valeri made this excellent interview with CA, he also had to endure some constructive critics on my part and he has learnt a lot from it.